Let an experienced advisor help you decide what's best for you and where to start. Call 01276 64124 or 07825 705942 to book a friendly chat on the phone or to come in and meet us. 30 set, professional kit in either Acrylic or UV Gel. Manicure and UV Gel Polish. Accredited training with home study and a full day in class. 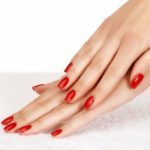 Get qualified and offer the very popular UV gel polish manicure. I have done a manicure and gel course and was very happy with the training provided. Learnt so much! 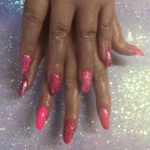 I have done my course with The Nail Academy and I found them very very friendly and helpful throughout, as soon as I met the team they made me feel very welcome and at ease during my course. I thoroughly enjoyed it. Iv only just qualified and have already done gel extensions for a customer who always went to the Chinese Bars!!! She was so over the moon with how I have done them, she is now my future customer. I can’t thank you enough for all your help you have given. I’ve done my UVGel course for beginners in August this year. It has been the best investment I’ve done in myself so far. Angie is a fantastic teacher! So knowledgable. There is no questions you can’t ask her. So much patience and such a good heart. Just right after I finished the course she helped me to find the job. I am working now in a very good beauty salon and even got customers to do the their nails at home. Very much recommend to do the course with The Nail Academy ! THANKS to ANGIE and her TEAM ! I did the manicure and gel polish course this year. Angie was really helpful from first contact. I met her before doing the course and she seemed to be very knowledgeable and advised me as to which course would be the best place to start. I really enjoyed the course and Angie was a great teacher. I would definitely recommend The Nail Academy to anyone looking for a career in nails! Really enjoyed training. The teacher is very professional and full of knowledge. Training was fun and packed with useful information. I would recommend Nail Academy to anyone who is looking for professional training. I am so happy I found this company to train with! It was always very professional, very helpful and very supportive! She gave me a lot of confidence which is important if you start something new (like I did). In fact I was so happy with The Nail Academy and the very relaxed environment that I have already booked myself on another course with Angie. Really pleased with all parts! Angie is a fab teacher, felt totally at ease and understood all of her explanations. Passed my course, so onwards and upwards!! Feel as though I’ve learnt so much in the time, I am very much looking forward to putting what Angie has taught me into practice. They didn’t make me feel silly if you had a question, thanks for a fantastic day, I feel very confident about taking things forward and eventually starting my own business. I trained with the Nail Academy on the UV Gel course and my business has really taken off, I would recommend the UVGel beginners course and I shall be moving on to do the conversion to acrylic next. The course was excellent, my tutor was always helpful and nothing was too much trouble. The content and all the information given was first class and I didn’t want my course to end so will be taking another one soon. A brilliant course. I loved the class, it was great fun. My teacher was great and made learning fun and enjoyable, she was really enthusiastic and we had a lot of hands on practice which was helped by the loan of the nail trainer. So informative, given tons of one to one in a very relaxed environment. Never made to feel a question is silly. I liked how things were explained in detail, and I enjoyed the mood and vibe of the course. The nail trainer was really useful although a little annoying to fix to things in the home. I really enjoyed this course, I found there was always help when I needed and everyone was very friendly. The hand trainer was a great idea and enabled you to build your confidence, have lots of practise and you were able to see your progress yourself. I am doing very well since I have left the course and i’m building up more and more clients. I really enjoyed the course. You have inspired me with all your help and enthusiasm to continue my training and hopefully attain the nail technician NVQ.